horses - Horse Motels International. Worldwide horse motel directory for the traveling equestrian. We find horse motels, horse hotels, overnight stabling, overnight boarding, horse hostels, ranches, bed and breakfasts, horses, and more. With the exception of emergencies, we will not be stabling horses after 10:00 p.m. Thank you travelers for your nice comments! Facilities: We provide equine layovers 5 minutes off I-5 @ Exit 673 for travelers with horses & those vacationing in our area with horses. This is not a boarding facility, therefore we can stable your large load. A turnaround area is available for big rigs. We focus on equine health & comfort. No horse is allowed in the barn without a negative coggins and current health certificate. A non-toxic, environmentally safe sanitizer is used for cleaning the stalls. Walls always finished with a sprayed sanitizer. We have 12 matted stalls, some with 16' x 25' paddocks. Barn is secure with paved and gated entry, non-climb fencing & paving around barn area. Stalls have high plank walls, especially suited for large horses, outdoor arena, pens, nice bathroom w/shower, 30 amp RV hookup. Mixed grass hay available. Mobile vet available. ATM machine at TA Travel Center, Exit 673. Deliveries to your door available from 28 Redding restaurants. Three hours south of Oregon. Truckstop, rodeo grounds, motels, RV Park on the Sacramento River, restaurants approx. 10 minutes from this facility. Suggested lodging: The 2015 summer renovation of Super 8 (pool and breakfast) has greatly improved the motel. They are now giving our customers a 16% discount, Tel: 530-221-8881. LaQuinta, (pool, breakfast, jacuzzi, WiFi) adjoins The Cattlemen's Restaurant, Tel: 530-221-8200. SUGGESTION: Go to tripadvisor.com to see pictures and other amenities.You may stay near your horses in our comfortable bunkroom with AC/heat, DVD. Location: Between Redding and Anderson. Please call for prices and easy directions. 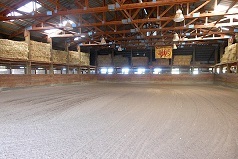 Facilities: We have a 14 stall barn and a 60' x 120' lighted sand arena. Plenty of large rig parking and turn around space. 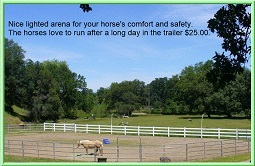 After a long trailer ride your horses might enjoy staying in the arena and stretching their legs for the night. There are 3,000 acres of riding behind us if you want to stay a few days or more. Horse boarding and hay is $25.00 a day. We DO NOT charge 501(c)(3) to stay here! You can arrive anytime day or night. Ranch manager on site 24 hours. Enjoy our wonderful RV & spacious trailer parking under the oaks. Hook ups $10.00. The pond is clean and is filled by the Sacramento river. Swim yourself or with your horse. The pond has a gentle sandy bottom slope that goes to 7 feet deep at the end. Take the bridge to the picnic area on the island or walk the dock while leading your horse in. Walk around and check out our 40 Turtles & Tortoises in our rescue & sanctuary. Take a break and stay as long as you like. Dogs welcome, too. Very quiet and relaxing after a long day on the road. Stores, gas stations & motels 2 miles away. Casino 5 miles. Check out our comments. We have the highest score of any horse motel in CA. Location: I-5 to Riverside going west. 1st Left on Little St. Dead end. Right on Alexander, cross over RXR tracks and Hwy. 273, continue on Third St. to end, cross over canal. 1st left is Happy Hooves Horse Hotel. 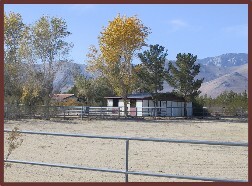 Facilities: We have 28 stalls on a ranch with 7.4 acres. Beautiful 60' x 100' indoor year round arena, 65' round pen, 160' x120' outdoor arena, six 60' x 40' outside grass turn outs, 4 wash racks, and a big parking lot that you will have no problems getting in or out of our place. Horse boarding and hay is $30.00 a day. You can arrive anytime day or night. Ranch manager on site 24 hours. Free Trailer and RV parking. Sorry no hook ups. Dogs welcome, as long as they are on a leash. Walmart, factory outlets, gas stations & motels are 1 mile away. Win River Casino is 7 miles away from our barn. We look forward to having you and your horse with us. Location: Only 1 mile off Interstate 5, northern California, 8 miles south of Redding rodeo grounds and 21 miles from the Red Bluff rodeo grounds. Take the factory outlet exit.. Right on Factory Road. Go under interstate 5. Go forward on Deschutes Road. Take the first exit on the right, Hawes Road. We are .5 miles down Hawes Road on your right. Look for the big brown and tan barn. Tel: 661-845-3013; Cell - 661-301-6668; Eric - 661-205-2135; Leave a message and we'll call you back. Facilities: One indoor stall, outside covered stalls,12' x 48' covered pens, feed, arena and round pen, hay for sale. We have 2 rooms with T.V., one queen bed and one full bed available. Camping for overnight. No hookups. 8 pens, small tack store. Location: Highway 58. Go south on 184/Weedpatch Hwy. Go 3 miles south to Hermosa Road. Go east 1/2 mile. We're the third place on the north side, a green house. Facilities: Three 1/2 acre pastures, arena, RV parking, top of the line alfalfa hay, covered paddock, tree cover, 55 gallon watering troughs, automatic water. $25 per horse per night. We have a bedroom with private bathroom and use of the kitchen available for $50 per night. 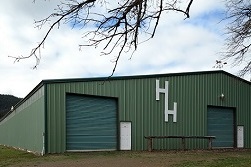 Facilities: 30 acres with plenty of big rig parking and easy access in and out of our facility. Stalls: $25 per night per horse. 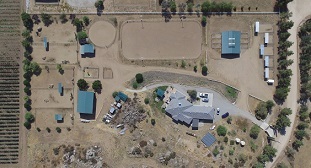 Partially covered, automatic waterers, turn-out arenas, lighted riding arena, trail access along the Kern River. RV Space: $25 per night includes electric and water. Dry Camping: $20 per night. Must call ahead for reservations. Contact Judi Cell (661) 699-6226, if no answer, Dawn Cell (661) 910-1165. Text or leave a message and we'll get back to you. Check out our website for information on our year-round boarding, events calendar, clubhouse & arena rentals. Lodging Near By - Sure Stay by Best Western, 2620 Buck Owens Blvd, Bakersfield, CA. Next to the famous Buck Owens Crystal Palace. La Quinta Inn & Suites-North, 8858 Spectrum Park Way, Bakersfield, CA (right off of Merle Haggard Blvd.). Go to https://www.tripadvisor.com to see pictures, reviews and other options. Many restaurants at both hotel locations. Location: 5320 Peacock Park Lane, Bakersfield, CA 93308. Facilities: We have full boarding and lay ups available. 50 ft Round pen that many people prefer over a single pen to give their horses a night of stretching before hitting the road again. We also have an arena, enclosed stalls, and covered paddocks. Straight through drive for big rigs. No turn around worries. You can also sleep in your trailer on site or leave it here and go get a room. The price is $25 per horse, $10 per electrical hookup per individual trailer. By advanced reservation only. Location: We are centrally located between I-5 and Hwy 99, between Los Angeles and San Francisco for those travelling through or around California. 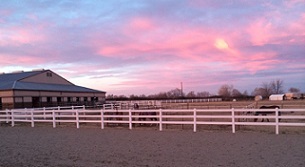 Facilities: Triple C Ranch sits on 40 acres in historic Bakersfield, Ca. Here at Triple C Ranch we have 40 indoor rubber matted, fully bedded, galvanized box stalls with automatic waterers and a lighted 150' x 75' indoor arena. We also have alfalfa available and 2 outdoor arenas with lights. Our arenas are also available for rent for horse shows, clinics, weddings, parties, and more. We have hosted clinicians Les Vogts, Buc Brenneman, Fallon Taylor, world champion barrel racer, and many others. 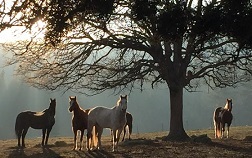 We offer year- round boarding in our large green, irrigated 7, 3, and 2 acre pastures for mares and babies. We have RV hookups and have ample parking for big rigs/trailers. Staff is on the premises 24/7 for you and your horses comfort. We are a quiet and secure facility always looking out for number one; your horse. We strive to give you peace of mind in your search in an overnight facility for your horse. Our price is $30 per horse per night. Location: 3.5 Miles south of Hwy. 58 on S. Fairfax road. Our barn is on the west, 5.5 miles south of Hwy. 99. Take Panama Lane, turn north on S. Fairfax, go 1/4 mile, our barn is on the west. Facilities: Our facilitiy offers overnight, outdoor stalls, also large turnouts. Price is $15 per horse; you feed and we can water. We can also feed in the morning for your if hay is accessible or left out for them. We can also accommodate those hauling cattle. We offer electrical and water hookups for RVs or Living Quarters for $20 a night. Location: We are located right outside of Barstow. Convenient to Hwy. 58, I-15 and I-40. There are hotels only 5 minutes away from the facilities and easy access from all highways. 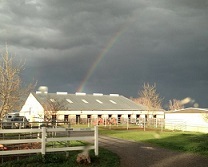 Facilities: RV hookups, horse stabling, barn stalls with runs, mare motel, round pen, arena, trails. Stay on our ranch in our 1 bedroom cabin (sleeps 2-4) with full kitchen and bathroom. Or bring your own RV we have full hookups with wifi and 30 amp service. Ride our groomed scenic trails on property or trailer out to local equine events. Location: We are close to Paso Robles fairgrounds, Paso Robles Horse Park, Twin Rivers Equestrian, and Morro Bay horse beach. We are surrounded by wine country, too. 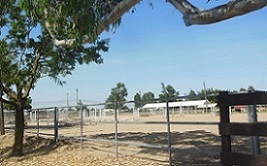 Facilities: 40 acre boarding/show facility. Lovely 18 stall barn, pipe corrals, pasture, 2 wash racks, 4 riding arenas, clean bathroom, huge parking area, easy access, Facility very clean, well-cared for, knowlegeable horse people/ owners on property. Location: 15 miles north of Sacramento, CA. Easy access off Highway 70/99. Take Elverta Road east, go three miles, take Sorento Road north...go one mile. Our ranch is on the right. The Ranch is only 10 minutes from the Sacramento International Airport, and 15 minutes from downtown Sacramento. Facilities: New Facility. Show barn w/12' x 12' & 12' x 16' matted box stalls, covered/outdoor arenas, turnout pens, lighted round pen. Stallions OK. Large Rig Turnaround. Owners on premises. Rates: Stalls $25.00 per night (includes shavings). Accommodations: Motels 5 minutes away. Location: Easy & close access to Freeway 99. From the North: Take the Shaw Ave. exit and turn left on Shaw. Turn left on Chateau Fresno. Turn right on Ashlan. From the South: Take the Shaw Ave. exit and turn right on Shaw. Turn left on Chateau Fresno. Turn right on Ashlan. Facilities: 8 covered stalls with waterers.7 pipe corrals without cover. Pasturing available. Large arena, round pen, and covered arena also. Located near parks with access to miles of trails. Overnight camping available. Electronic entry gate security. Location: 5 minutes off of 101 in Gilroy. 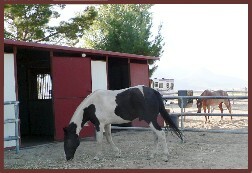 Facilities: Small private ranch in the foothills of the eastern Sierra Nevada Mountains. Two 12' x 12' matted box stalls with 30' x 30' adjacent pipe corrals. 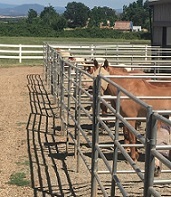 30' x 60' outside corral for horses that stable together. 200' x 160' sand arena and turn-out. Trailer drop-off. RV available to rent, or RV site with hookups. Motels, restaurants available in nearby Inyokern or Ridgecrest. Location: 1/2 mile east of Hwy. 395 (5 miles north of Hwy. 14/395 junction). Please call for rates, reservations, and easy directions. Ride or hike the many mountain wilderness or desert trails around our beautiful southern Sierras. Facilities: You have arrived at the friendliest and most spectacular horse motel located in Lodi CA known as “The Hitching Post”. Located on 9 flat, spacious acres only 3.7 miles from interstate 5 and only 3.5 miles from Hwy 99 we strive to provide the most relaxing and easy travel experience for you and your horse. Lodi Ca is best known for being a center of wine grape production and the “Zinfandel Capitol of the World”. If you have time and want to make a vacation of your trip shopping in downtown Lodi is only seven minutes away and Van Ruiten Family Winery is located 4.7 miles from the ranch with a tasting room open daily. “The Hitching Post” offers a lighted 50’ round pen, cold water wash rack, lighted outdoor arena 120’ X 192’ , patience pole and plenty of safe areas to tie. We recently added a wonderful new shed row style barn to our facility in 2017 with 4~ 12’X12’ fully matted stalls each with 12’X36’ attached pipe coral runs. The barn has lights and plenty of power availability. When requesting stalls you will arrive to a clean and freshly bedded stall for your horse and cleaning provided 3 times per day or more. We also have 2 mud free paddocks each with a 12’X12’ 3 sided shelter with rubber mat flooring. We have 2 other shelter/run areas, 1~37’X30’ 1~16’X23’. For summer, or horses that don’t need/prefer shelters we also have 2 larger paddocks 1~22’X67’ 1~85’X60’. We have 3 larger turn out areas with some grass 1~90’X150’ 1~ 80’X150’ 1~62’X120’. All paddock, stalls and pastures have automatic waters and access to salt blocks. All the horse areas are cleaned multiple times per day. We feed 3X per day, and offer 50/50 Alfalfa Orchard grass hay or Alfalfa/Teff grass cubes for $5.00 per feeding or we will gladly feed your own hay at no additional cost. Supplements and grains can be fed for an additional $2.50 per feeding per horse. Our rates for the horse motel are $40.00 per day for one trailer one horse. Additional horses will be $20.00 each. We do require a current negative Coggins and Health Certificate. There are plenty of shaded areas for parking in the summer and all driveways and paths are made of compact gravel. We have plenty of flat easy turn arounds for even the largest of rigs. We also have electric hook ups for 4-6 rigs, as well as water/electric hook ups for 2-4 rigs. No septic dump is on site, however there are dumps available 7.7 miles from the ranch at Flag City RV Resort. The owner of the facility is on site 24/7 with electronic gate security. We do require at least 24hr notice prior to your arrival. Please contact Gary Anderson at (209) 993-5175. **Notice** Important information regarding access to the ranch. Google maps directions are correct however there is no way to turn across North Lower Sacramento Rd due to a new concrete median. So easiest access from HWY 99 is to take Armstrong Rd exit heading west and turn left on N Lower Sacramento Rd putting the driveway to the ranch on the west side of the road. If traveling south on I-5 from Sacramento the best exit is HWY 12 @ Flag City heading east to N. Lower Sacramento Rd and turn right. If traveling from southern CA on I-5 exit 8 Mile Rd. Left on Davis Rd, right on Armstrong Rd and right hand turn on N. Lower Sacramento Rd. * Please don’t hesitate to call for any help with directions if you are unfamiliar with the area. * We look forward to seeing you. Location: The Hitching Post horse motel is conveniently located only 3.7 miles from Interstate 5, as well as only 3.5 miles from highway 99. 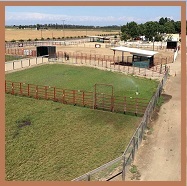 Facilities: Stalls with paddocks or paddock with cover, round pen, and an arena. Easy in and out for horse trailer and trailer parking. Bunk house with lodging for 2. One bedroom with queen bed, bathroom, kitchenette with coffee maker, microwave, toaster oven and refrigerator. Sitting area with electric fireplace, central heat and air. Stay at our beautiful bunk house and bring your horses. We also have The Guest House that sleeps up to eight, for lodging. You can hit several different trails from our ranch within a short drive. We are within a 20 to 35 minute drive to several horse trails including Coast to Crest trailhead at Turkey Hill staging area at South Shore Lake Comanche. North Shore Lake Comanche, China Gulch, New Hogan Lake trails and Lake Pardee Rancho Seco Trail. Or if traveling, you and your horse can stay at the same place, no need to motel up. Location: We are 7 miles east of Lodi and 3 miles south of Lockeford and 8 mile southwest of Clements CA. Facilities: Vacation with your Horse. Harris Rustic Ranch is the perfect place to take a mini vacation with your horse! Enjoy our overnight accommodations, which are available by reservation. We also cater to the ENDURANCE and TRAIL RIDING enthusiast, as well as those transporting horses. Conveniently located 3 miles off I-80 in Loomis, CA. The property has immediate access to the Pioneer trails and Folsom Lake trails.Services Rustic Ranch offers: Overnight accommodations including a bedroom with its own separate entrance, kitchenette, T.V. and includes a private bathroom with shower; covered patio off entrance and seating area; swimming pool with BBQ area; 1/4 acre oak-studded pastures with covered shelters allow horses to move freely in a ranch like setting; warm up arena; direct access to trails; wash rack / grooming area; circular driveway; trailer parking; short term /long term horse boarding available. Rustic Ranch is a private facility with owners on the premises. Facilities: 3 bed 2 bath fully furnished modular available ... reservation required ... great for groups, 6 stall barn with runs, 2 paddocks with cover, pasture, regulation size arena, round pen, wash rack and easy big rig turn around. Location: 8 miles south of Yreka, CA. 10 miles off of I-5 down Hwy. A-12 and 8 miles from Hwy. 97. Facilities: 3 In-barn box stalls, 12'x12', fully matted. Two large paddocks, one with a shelter. Round pen, wash rack. 1/2 mile exercise path. Trailer parking for up to 6 horse size rigs. $25 per horse per night with your Feed. (Health certificate and Coggins required). Location: 3/4 mile off of Highway 1. 25 minutes to San Francisco and the Cow Palace. Facilities: Large RV sites with water, no other hook ups at this time, (sites 54-90' in length, 9 sites available) & 12' x12', 12' x 16', 16' x 16' overnight pens with water. Round pen, arena, trails on site. Event center facilities: covered caterer area, bar, covered DJ/band area, large fire pit, large area for events, grassy area, large concrete dance floor. Arena can be rented for equestrian events, weddings and other events also possible, lots of parking. Fabulous mountain views surround, easy access off I-5 and state route 89. Facilities: Fully covered 12' x 24' stalls with mats, bedding pellets and shavings. We have lights everywhere (stalls, arena, hay barn), and outside our tack room we have dusk to dawn lights, so it's never dark. 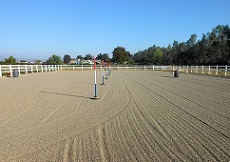 Immaculate facility in the center of Norco, CA - Horsetown USA. Weighed hay, and stalls cleaned 4 times daily, 7 days per week. Will fly mask and fly spray, and turn out into arena. Double wash rack. Many excellent references. Lived here since 1990. Very quiet and safe facility, 400 feet from the street. Less than a mile from the I-15 freeway. Location: Three hours from Las Vegas and less than a mile from the I-15 freeway. One hour east of Los Angeles in Riverside County. Facilities: If you're heading toward the Sierra Nevada Mountains to ride, or just passing through, this is the most convenient stop you will find. We are located 1/2 mile off Hwy. 395 and right off Hwy. 178. We are very close to the Hwy. 395 and Hwy. 14 interchange. We have a lot of room to pull in, turn around, and pull out. We have room for you to drop your trailer if needed or, for a small fee, stay in your trailer overnight close to your horses. We offer clean and dry 24' x 24' or 24' x 48' pipe stalls with shelters. There is a round pen and a huge turnout if needed. Call or text if you would like to visit or stay at our facility. We will be happy to accommodate you and your horses. Location: Between Ridgecrest and Inyokern, right off Hwy. 395. Facilities: Full training facility with box stall or turn out pens for overnight. Stalls are bedded with hay included. Close to Disneyland and other attractions. Hotels close by, private ranch with 24 hour security. Lots of trailer parking. Location: Off 60 freeway and 15 freeway interchange in Riverside. Right off the freeway, Close to 10 and 40. Facilities: Horse barn with 4 available foaling size stalls 12' x 16' that have 3/4" rubber mat flooring and 18' pipe runs from each stall. Lights and auto waterers. Front of barn includes a horse examination chute and complete veterinary service area. Covered, lighted wash rack area with hitching rail, cross ties and wash rack/exam chute. 100’ by 200’ lighted arena. 70' diameter round pen. 5 pipe paddocks with shade and automatic water, 1 - 48' x 24', 1- 36' x 24' and 3 - 24' x 24'. We have one bedroom with a queen size bed and full bathroom with separate outside entry. Wi-fi and TV in the room. Breakfast served upon request. Location: Just east of the lovely Temecula Wine Country and south of the city of Hemet, in the hills with safe, well maintained dirt roads for great trail riding right from our ranch gate. We feed top quality alfalfa hay or your hay, grain or supplements upon request. Location: Located 30 miles from San Luis Obispo or Paso Robes, bordering Santa Margarita Lake Park with miles of trail riding. 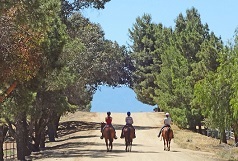 Ride-in horse camp 5 miles from Titania Ranch on the lake, minutes from Los Padres National Park. Facilities: Horse boarding - in and out stall - daily, weekly, monthly and long term for all your needs to provide quality care to your horse(s). Location: North of Burbank and convenient to I-5 and I-210. Facilities: Over night stabling, you have the option of either a steel MD barn 12' x 12' bedded stall with auto waterers, or a 1/5 acre pipe panel irrigated pasture pen. 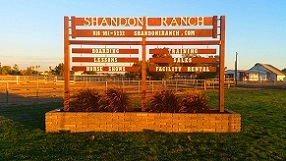 See our website for additional pictures of our ranch/facility. We are located 3 miles west of Interstate 5 at the corner of Highway 4 (west) and Wilhoit Road. Plenty of access and parking for large muti horse trailers. 110 Electrical hook up available @ $5.00 per hookup. Facilities: Pipe Corrals with 3-sided shelters, barn stalls, paddocks and pastures. Alfalfa provided for the horses and coffee for you. Location: Between Alpine Village and Stallion Springs in Cummings Valley. Approximately 12 miles from Tehachapi town center. Directions will be sent with reservation notice. Negative coggins and current health papers are required. Facilities: 24' x 36' partial covered pipe stalls (2). Round pen, arena and community trail access. 15 minute drive to miles of wine country trails, and minutes from Old Town shopping and restaurants! Can park 4-horse and small LQ rigs in our driveway. We have no designated hookups. Call or leave a message to check for availability. Location: Los Ranchitos horse community in Temecula, CA. Facilities: 15 stalls, lighted barn. 12' x 12' stalls. Automatic waterers in stalls. Round pen and outside paddocks available. Stallions welcome. $25 a day. Specializing in racehorses. Conveniently located next to Galway Downs training track and San Luis Ray. Location: Temecula, next to Galway Downs off Rte. 79. Facilities: 4 12' x 12' stalls with 12' x 24' runs. 1 full RV hookup, additional electrical. Very quiet and safe area. 80' x 220' sand arena. Several hotels close by in Willits, as well as food, stores, and gas. Large driveway, easy access for larger rigs. Please call as much ahead as possible. Alternate number is 707-548-4328 (cell). Location: Located in Willits, off Highway 101, 1/2 way between Crescent City and San Francisco. East on East Commercial Street to Valley Road. (Commercial Street turns into Valley Road past the County Yard). Continue approximately 1.5 miles to Eastside Road and make a left (north), we are the first driveway on the right. Facilities: 12’ x 12’ covered pipe pens $35 per night per horse. For reservations, click: Here. We offer 3 outdoor arenas (1 with lights) and 1 indoor arena (with lights), wash racks, turn out pastures, round pen and ample parking and turn around for large vehicles. We are 3 miles from Interstate 5 (10 minutes north of the Sacramento International Airport). Major shopping, restaurants, and hotels are minutes away. You are welcome to stay in your RV (no hookups)at no extra charge, or leave your trailer and stay in a motel. $35 per night. Location: Easily accessible from Interstate 5. Take the County Road 102 exit, go north on Road 102 (approximately 3 miles), turn left on County Road 18C and we are 1/2 mile on the right. 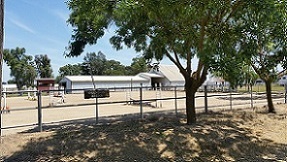 Facilities: Indoor arena, outdoor arena, round pens, covered stalls, open pasture. Limited trailer semi-hookups. Trails throughout 1,000 secluded acres. Three guest homes, ideal layover spot for the equine traveler. A perfect vacation spot to ride your horse on picturesque trails. Location: Northern California, just 2.4 miles off I-5. 22.2 miles south of Oregon. 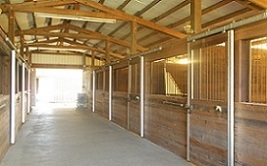 Facilities: 4 covered stalls, 12' x 24'. Arena & round pen, wash rack, and hay available. Water & electric hook-ups available for living quarters horse trailers. We have travelled ourselves and used horse motels and had such a good experience we wanted to offer our place for weary travelers and their steeds. We welcome you coming to stay. Health certificates and Coggins required. Location: We are located 6 miles off the 10 Freeway; easy to find and easy access to 10 Freeway & Yucaipa Equestrian Center.